The Magnum is a fully hydraulic ride on sweeper, equipped with a built in house filtration system for complete dust control. This industrial sweeping machine is designed to be productive, durable and it offers enhanced driving comfort along an increased value for money. HOW MANY VERSIONS IS THE MAGNUM AVAILABLE IN? The Magnum ride-on sweeper is available in battery, GPL and diesel engine versions, depending on your specific needs. WHY IS THE MAGNUM SO RELIABLE AND ROBUST? The Magnum is manufactured with a durable steel structure and has a total weight of 1.175 kg, it is fitted with a water cooled Kubota 3 cylinder engine that is incredibly powerful. The hydraulic traction drive means the Magnum is able to climb steep inclines and can operate in even the toughest environments. Yes, the Magnum has impressive maneuverability, thanks to responsive steering, high visibility from the driver's seat, accessible and intuitive controls, a compact design that allows for a 180o turn in only 2.900 mm and large surface rubber tyres for the easy navigation of all surfaces. These features make the Magnum not only maneuverable but also increase it's safety and reliablity, meaning it is easy to use and tailored to every operator. 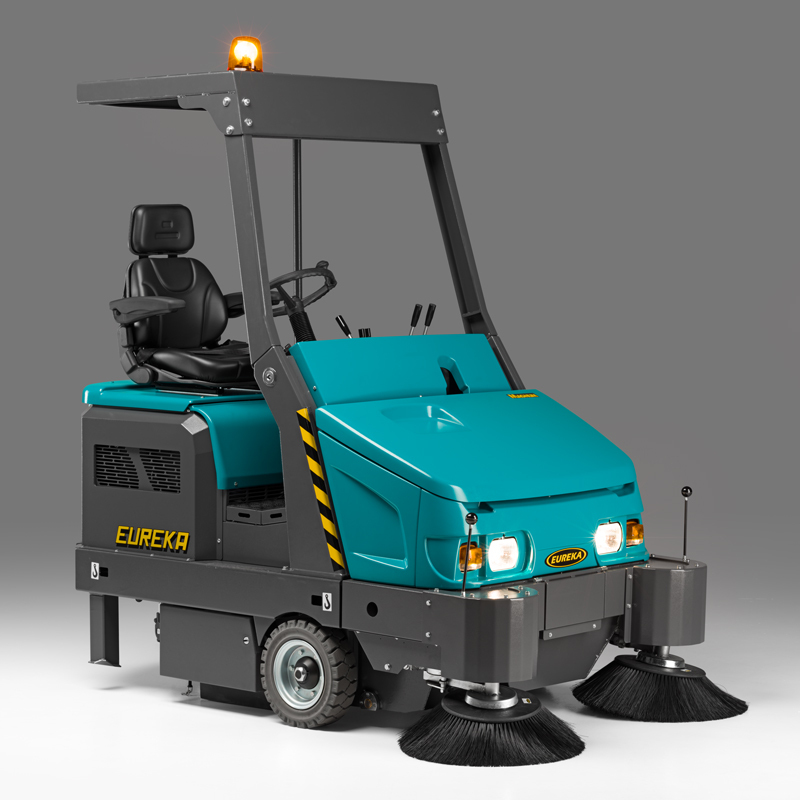 The Magnum ride-on sweeper offers the standard Eureka S.p.A. security features such as: electric brake, mechanical parking brake, front and rear lights, reverse sound, claxon and warning light. The features coupled with high visibility and an anti-tilt system mean the Magnum is incredibily safe for the operator and others in the surrounding environment. WHAT TYPE OF FILTER IS FITTED ON THE MAGNUM? The Magnum is fitted with a special polyester bag filter desgined by Eureka, which unlike paper filters can retain up to 99.9% of dust particles. The filter has an unbeatable lifespan as it is made from durable materials and can be washed. The Magnum runs an automatic filter cleaning cycle, every time the machine is turned off, this keeps the filter clean ever if the operator forgets. HOW CAN I ADJUST THE MAIN BRUSH? The main brush is floating and adjusts automatically according the the surface and to wear, this means the Magnum delivers consistent results in every environment. The operator also has control of brush pressure and this can be simply adjusted when required. STRENGTH The carefully selected materials, robust quality controls and the compact design guarantee strength and reliability. POWER The hydraulic traction ensures powerful drive, up to 12 km/h. MANEUVERABILITY The Magnum is particularly compact for maximum maneuverability in narrow spaces. EASE OF USE all controls are simple and clearly marked. ERGONOMICS All controls are designed with the operator in mind. LOW OPERATIONAL COSTS User-friendly operation reduces time and cost of training, simple maintenance and high reliability lower running costs. The Multi-level dumping system ensures easy emptying. The hopper, located at the front of the machine, can be hydraulically raised up to 1.54 m. The hopper is actually floating on the floor, and automatically adjusts to allow for easy pick up of larger waste. 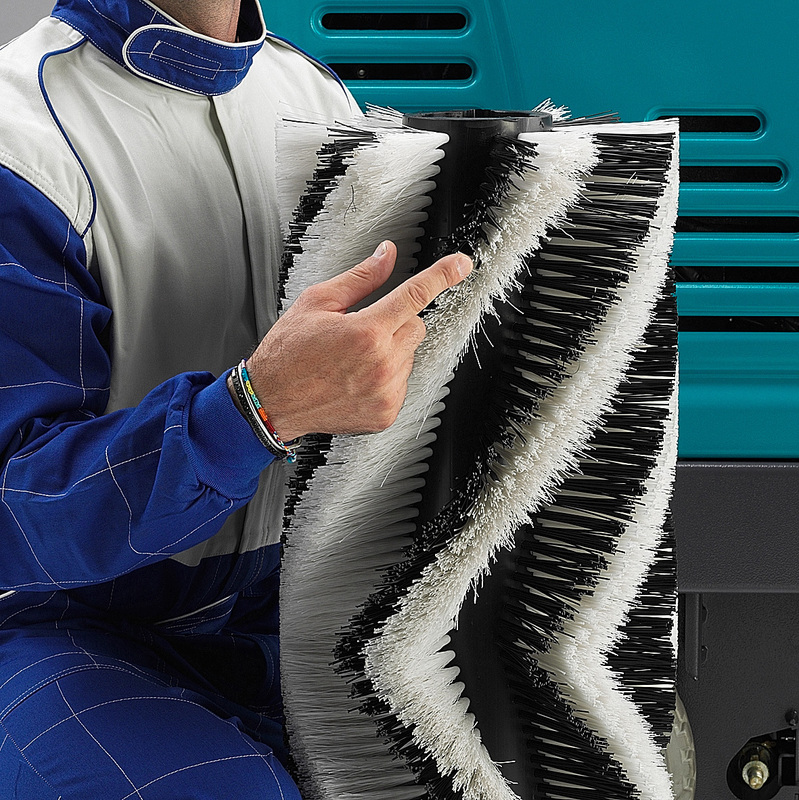 The floating main brush floats automatically adjusts itself to uneven floors and wear. Additionally, the exclusive “Multi Bristle ®” system enables the main brush to achieve exceptional performances in all conditions. The main brush can be replaced in a few seconds, without tools. The Magnum is equipped as standard with a polyester bag filter, class L, which is particularly efficient at retaining fine dust, and has a much longer life than all other traditional filters. The petrol version is also adapted for use with LPG. It is therefore possible to work in both indoor and outdoor environments with the same machine. 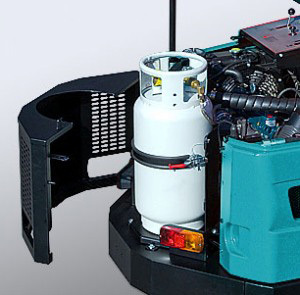 All parts, motors and engines are easily accessible for servicing as side, upper and rear panels can be fully opened. 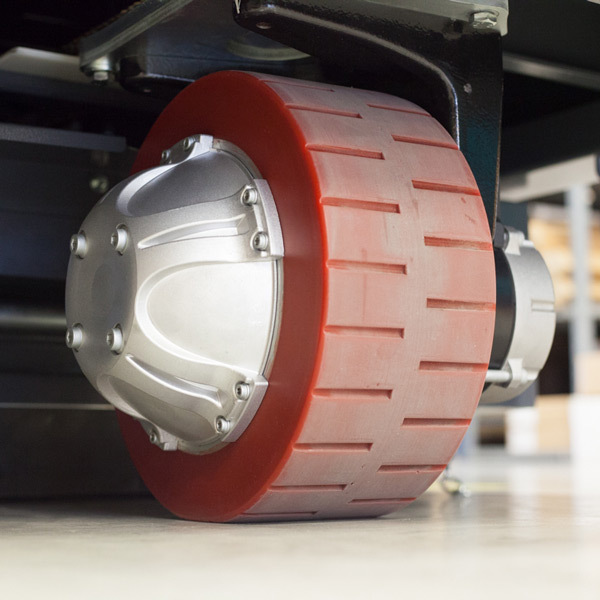 Batteries (EB version) can be replaced easily and quickly thanks to a battery trolley mounted on rolling bearings. This slides out for ease of use. Eureka’s robust Total Steel line of sweepers comprises of heavy-duty machines fully reinforced for maximum impact resistance. The result is a sweeper built to perform in the harshest industrial conditions and to endure intense usage. 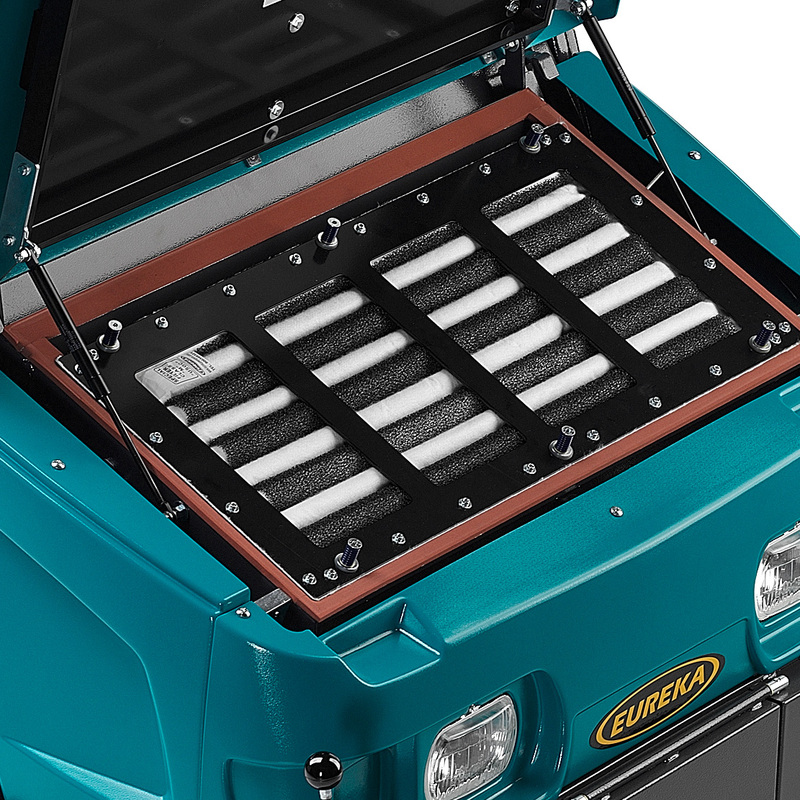 The new electric motor delivers 4 hours of working time with minimal noise impact.